In my travels at the end of April, not only did I treat myself to a new sweater project to cast on, but I also started a new pair of socks. My Pi Shawl is getting close enough to being done that it is not really very portable any more, so that meant it was time to tee up a new purse-knitting project that I could pick up and put down whenever the occasion arises. And lo, I started a new pair of Jaywalkers. Ahhhhh, hello Jaywalkers my old friend. I’ve come to knit with you again. I’ve knitted so many pairs of these in my knitting lifetime but the last pair might actually be almost a full year in the rear view mirror. I love these guys. They fit great, they work so nicely with multi-coloured or self-striping yarn, and I still have several pairs’ worth of Lorna’s Laces sock yarn in my stash waiting to be knitted up into these. Turns out my brain remembers these and finds it reassuring to start a new pair, especially when travelling – it’s a combo I’ve used before and it serves me well! I don’t know if these will be a pair for my own sock drawer or for a future gift recipient, but I’m liking them all the same. 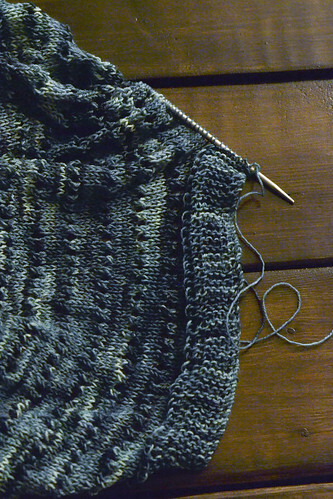 And speaking of that good ol’ Pi Shawl – someone’s getting a knitted-on border. And that means that same someone is even closer to getting finished and blocked. Soon, my new shawl friend, soon! Do you have knitting projects or patterns that you like to pair up with different places or activities? If you do, I’m sure your brain thanks you for the decision-making shortcut. Deciding what to cast on is sometimes half the battle. Have a fabulous knitting weekend, blog friends! Hitchhiker seems to be my go-to project! I have one Jaywalker sock finished (from a few years ago?) and I should do the other one! Lovely pattern, perfect blend of mindless yet interesting knitting. I always have a Sockhead Hat on the needles for on the go knitting. I love that it’s so easy to pick up and put down. Plus I don’t have to do any counting except for the cast on until I get to the decreases. I also always have a pair of socks on the needles for meeting times where I just need to listen. Unfortunately, I haven’t settled into one specific pattern for socks; however I’m sure I’ll find my favorite soon! There’s just too many out there that I want to knit. Hmm…the project I’ve been working on lately isn’t really portable outside my house…it’s an afghan. Portable ones for me would probably be hats and bags. I really like how your yarn is knitting up. I got to thinking, and the only thing I have knitted often enough to have it be a familiar friend on the needles is Knitty’s Nautie pattern! I do love them though, and aside from needing to carry around a fistful of stuffing, the pattern is pretty good for travel! I go to an afternoon knitting group, and we have all found that only mindless knitting is successfully done during our 2 hours of talking and knitting. Anything more gets redine when we return home because of major mistakes. Having something at the mindless state each week is sometimes a challenge. Jaywalkers are a good choice. I love that colorway for the Jaywalkers! Looks great! Hands down Glenn, these patterns are absolutely fabulous!! 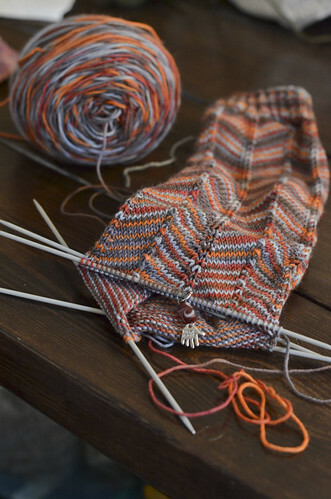 the pi shawl is beautiful and cable shot is mind blowing. I am going to use this same pattern for my upcoming project. Thanks for the pattern..I will be subscribing you more posts like this..